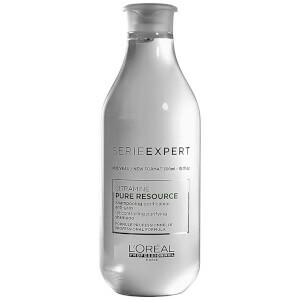 Treat your hair and scalp to the purifying properties of L'Oréal Professionel Serie Expert Pure Resource Shampoo, a nourishing formula that performs an effective cleanse to rid hair of product build-up. Recommended for normal to oily hair, the formula helps to cleanse away dirt and oil, expertly purifying the hair and scalp whilst reducing product build-up, restoring radiance and controlling natural oils on the scalp. Infused with Vitamin E and Citramine, the shampoo will leave the hair and scalp feeling clean and protected. Wet your hair and distribute shampoo evenly throughout. Massage to create lather. Rinse thoroughly and wash your hands after use. In case of contact with eyes, rinse them immediately. Aqua/Water, Sodium Laureth Sulfate, Citric Acid, Coco-Betane, Sodium Chloride, Ammonium Hydroxide, Hexylene Glycol, Sodium Benzoate, Salicylic Acid, Polyquaternium-10, Linalool, Coumarin, Sodium Hydroxide, Parfum / Fragrance. C166234/4.